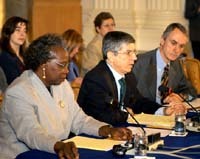 The Organization of American States (OAS) today reviewed Grenada’s November 27, 2003 general elections, concluding that the results reflected fully the wishes of the population.Trinidad and Tobago diplomat Ambassador Corrine McKnight delivered a preliminary oral report to the OAS Permanent Council observing, as Chief of the OAS Electoral Observation Mission in Grenada, that “the state of democracy in Grenada is basically well-entrenched.” The Mission was organized by the OAS’ Unit for the Promotion of Democracy (UPD) at the invitation of the government of Grenada. The OAS team had met with the Prime Minister and senior authorities as well as representatives of political parties and civil society. McKnight noted how helpful those meetings had been as she praised the Grenadian people for their enthusiastic and cooperative response to the OAS mission. Recommendations - including on the need to better link voter registration to the civil register and the electoral register - will be submitted to the Secretary General in a formal, written report, McKnight said. She thanked the OAS for the opportunity to serve and acknowledged the assistance of the team she called “unique individually and collectively,” and singled out the UPD’s Dr. Bruce Rickerson for special mention.